Do you have a cracked or broken a tooth? Do you have a missing tooth that you wish to replace? Are you unhappy with the aesthetics of your teeth? Our dentists can help you choose the best solution. Crowns and bridges are custom-fitted tooth supported prosthetics that function and look like natural teeth. While crowns can cover and protect a single tooth, bridges are used for those of you who may have a missing tooth. Veneers are a minimally invasive solution for those unsatisfied with the esthetics of their smile or for those with slight tooth damage or discoloration. 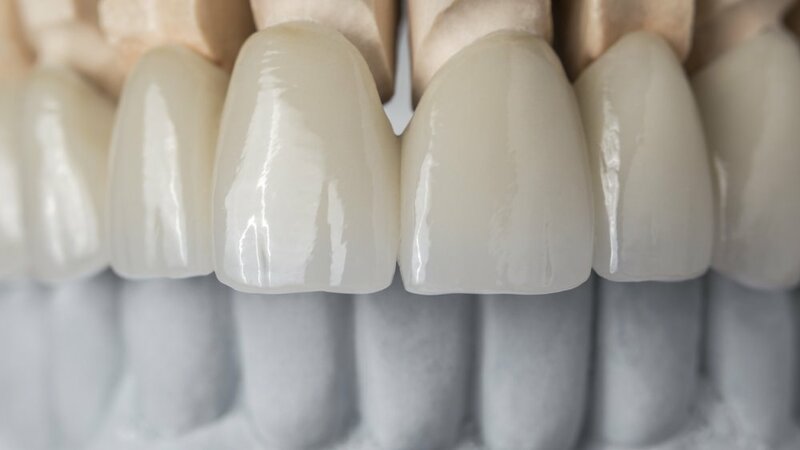 These thin porcelain or resin veneers come in customizable colors, lengths and shapes and are bonded to the surface of your teeth. A crown, otherwise known as a cap, is custom-fitted to your bite and is placed over your natural tooth or dental implant. A crown is indicated for a structurally weakened or heavily restored tooth that is at risk of fracture, correct dental misalignment, and improve bite planes. A dental bridge serves as an option to replace a missing tooth, or teeth. Deciding between a bridge and dental implant is based on each individual case. If you have neighboring teeth that would benefit from a crown, due to structural weakness or decay, or if an implant is not an option for you, a bridge is a reasonable option to restore a space in your dental arch. If you’re looking to cosmetically correct or enhance the appearance of one or more teeth, veneers can be a good option. They are thin, porcelain or resin shells that are customized in color and shape to optimize your smile. Veneers are minimally-invasive aesthetic treatment. Common uses for veneers include chipped, irregular, malformed, or discolored teeth.